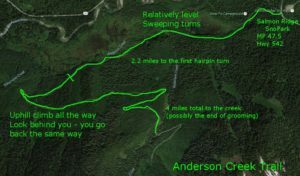 The Anderson Creek Road is directly across the street from the Salmon Ridge SnoPark parking lot. It often has slightly better conditions than Razor Hone for both Classical and Skate Skiing. The first map shows the entrance to the trail. When first looking for it, many people go down the road into the campground which dead-ends in a nice area, (which is good for exploring) but with no groomed trails. Instead, when you are next to the Forest Service sign, look to your left. 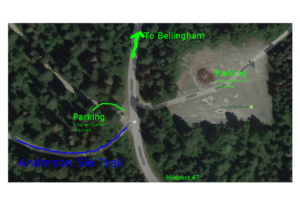 There is a snowberm – climb over that berm and you should immediately see the groomed trail. If you pass through a gate 100 feet up the road, you are going in the right direction. The 2nd map shows the general outline of the trail. The trail has nice smooth rolling gradient for the first couple of miles. Open turns and gradual slopes. Great for beginning and intermediate skiing. As it approaches the first switchback, it starts going uphill, then it continues on for a couple of miles, gaining elevation. Look behind you – you will be skiing back down the same way!